​Only one year after the release of the Model T Ford in 1908, the first motorhomes began appearing on American roads. In their time, these primitive houses on wheels were widely considered state-of-the-art because they were loaded with an array of features that aided in transporting families both short and long distances in relative comfort. As time progressed, motorhome manufacturing evolved from an ad hoc industry full of homemade contraptions into a cohesive and thriving industry comprised of sleek body styles and luxurious interiors. During the 1960s and 70s, the term motorhome was synonymous with one company—Winnebago. During the formative years of the recreational vehicle industry, Winnebago was on the front lines, and the company continues to be an industry trailblazer to this day. Named after the company, the first motorhome built by the Iowan company was released in 1966. Prior to this, the company primarily built trailers, and its existing infrastructure helped them become pioneers in the recreational vehicle market. While its competitors came and went, Winnebago was able to utilize its efficient production lines to offer volume pricing discounts, which allowed the industry pioneer to offer quality motorhomes at prices considerably lower than their competition. It was clear from the outset that Winnebago thrived on innovations such as the unique over-the-cab upper bunk and foam-insulated body panels. The company experienced huge sales volume in the early 1970s, making it a household name in the motorhome industry. Winnebago weathered the storm of economic uncertainty and the fuel crisis of the late 1970s and early 1980s to emerge as the definite leader of the recreational vehicle and motorhome industry. During its early years, Winnebago designed limited models that provided much improved function. Today, there are nearly a dozen Winnebago styles, and among other things, the company has focused its creative tendencies on innovative interiors. The first Winnebago models, some of which can still be seen cruising the roads today, featured basic kitchens, baths, dining and sleeping facilities. The models of today are specifically designed to take advantage of every square inch of possible space incorporating all of the luxuries found in modern homes. For example, the most popular model of Winnebago for sale has a large shower and bathroom amenities you could expect to find in a nice condominium. 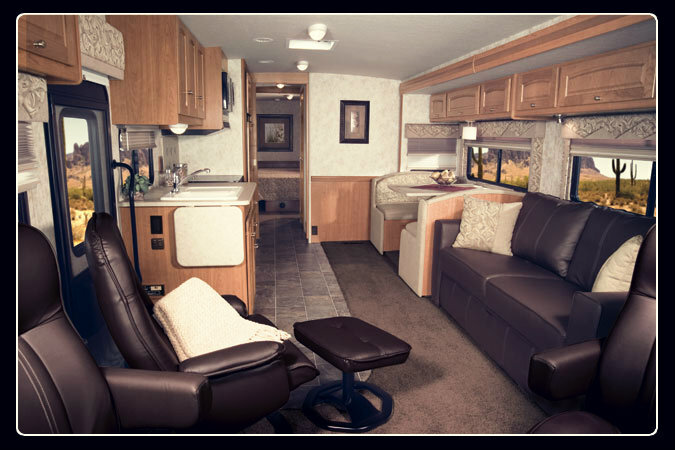 The newer Winnebago camper trailers for sale feature reclining leather sectionals that can turn into full-size beds with a single press of a button. Furthermore, most of the interior furniture is extendable, so couples or smaller families can fold away unneeded furniture for increased space. 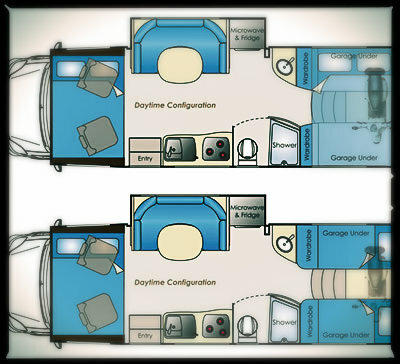 In addition, modern Winnebagos for sale have retractable sides for added living space. Winnebago has been a leader in the motorhome industry from the very beginning. With distinct manufacturing advantages and world-class designers, Winnebago was able to make cutting-edge motorhomes that were more affordable than the offerings of its competition, making its motorhomes attainable by a large percentage of the population. Despite the economic changes that have taken place over the years, Winnebago‘s continued focus on combining luxurious amenities at an affordable price has made the company one of the most popular motorhome brands on the market. Today, anyone in search of motorhomes or camper trailers for sale look to Winnebago to provide them with a quality, feature-packed recreational vehicle that they can afford.